Morning walk is a great way to start your day. Even if you’re not a morning bird, as soon as you get outside and breathe in the fresh morning air, you will definitely feel refreshed and inspired. Getting up early in the morning makes you feel so much energy in your body. Read these morning walk quotes below that will help to put you in the right mood to try it at least once. That’s a right way to start your day. The simplest things can make us happy. You have so much energy in the morning. If you start your day right, you will feel strong and energetic. Your soul will become young, and body will become strong as long as you enjoy morning walks and nature. Take your time, go for a walk, clear your head, find the answers you’re looking for. No matter where you live, the morning walk is always a good idea. Morning walk is a good way to build up your body. Morning walks give us time to think. This quote shows us the beauty of the morning. Such simple things are the most important components of our lives. When you go for a walk, your time belongs to you. 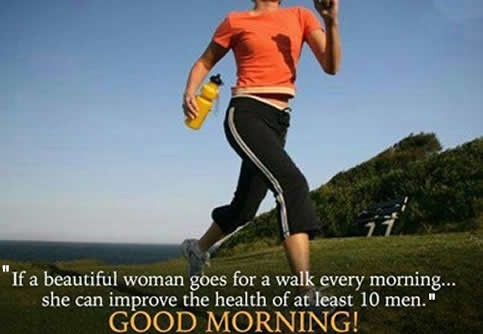 Morning walk helps you lose weight. Funny quote about morning walk. Just relax and enjoy yourself. Happiness is so simple, yet so amazing. Connection with nature is the best way to start your day. When you feel bad – go for a walk. We are truly lucky if we can go for a morning walk. Inspiration can be found in the morning walk. A morning walk can make you an attractive person. Morning walk is an exercise you will definitely enjoy. Morning walk quotes teach us that in most cases great things are hidden in simple ones. Spending some time with your thoughts and nature will help your self-development.